Harvesting wet wheat can boost test weight, prevent field sprouting, and increase soybean yield when double-cropping. However, farmers who plan to harvest high moisture wheat need to pay close attention to some specific handling and drying skills to prevent spoilage and loss of quality. Drying Wheat Below 20% Unheated air drying in a bin equipped with a drying fan and fully perforated floor is limited to grain moistures of 16% to 18%. A maximum of no more than 20% may be dried without adding heat, if stirrers are available. The fan should be turned on as soon as the bin floor is covered, and it should be run CONTINUOUSLY day and night, rain or shine, until the grain moisture in the upper layers is below 15%. Tables 1 and 2 summarize the moisture contents that soft and hard wheat will balance equally at various relative humidity and temperature combinations. The higher the temperature and the lower the relative humidity, the drier the wheat will become. Soft wheat will reach lower moistures given the same air conditions than hard wheat. Equilibrium moisture content of soft wheat at different drying air temperatures and relative humidities. Equilibrium moisture content of hard wheat at different drying air temperatures and relative humidities. Once the moisture content drops below 15%, the ambient air loses its drying potential, and the fan should operate only during the "good" part of the week. To reach the desirable moisture content of 13% to 14%, fan operation between 8 a.m. and 10 p.m. usually succeeds in most parts of Indiana. Drying Wheat Above 20% Heat is required for wheat moistures above 20%. Drying should be accomplished fairly rapidly to reduce the risk of mold development and subsequent spoilage. To be safe, a 2 to 3 foot deep batch in a bin should be dried with 2 to 5 cfm/bu to 14% in 24 hours. No more than 3 to 20 degrees F should be added. High-temperature batch or continuous flow dryers also will work well for wheat. Because of the high airflow rates in these dryers (50 to 125 cfm/bu) supplemental heat may not be necessary. If heat is used, the air temperature should be throttled by firing the burner for only short time intervals, or by firing it continuously at reduced fire rate (for example by changing the gas burner orifice). Airflow In a bin drying system, the difference between moving air through corn versus wheat is significant. For the same airflow per bushel, wheat can be filled only 60% as deep as corn. Thus, 10 feet of wheat is equivalent to 16 feet of corn in terms of resistance to airflow. 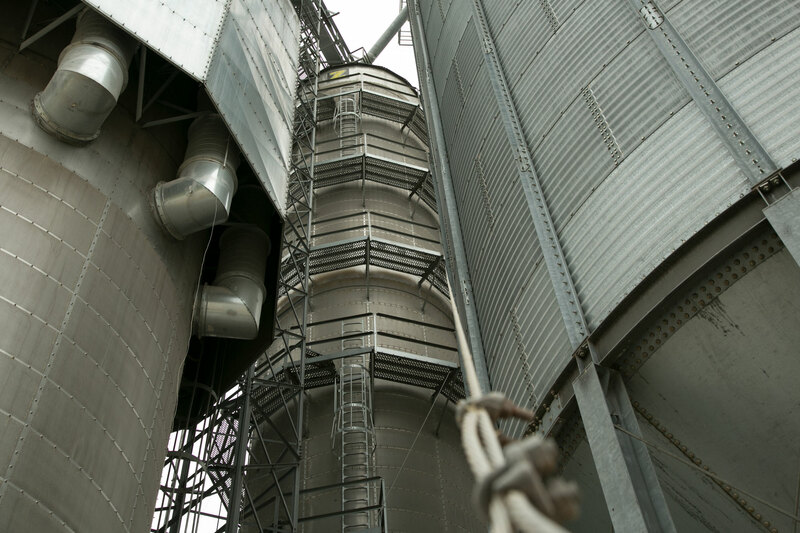 As a rule of thumb, a bin filled with 10 feet of wheat will require one horsepower of fan capacity per 1,000 bushels of grain to deliver 1 cubic foot of air for every bushel of wheat. Thus, a 30-foot diameter bin filled to 10 feet with 5,600 bushel of wheat would require a 5.5 HP fan. However, this relationship does not hold above 10 feet of depth. Doubling the depth of wheat to 20 feet cuts the airflow by 70% to 0.3 cfm/bu.